Fabricating Tubes. Design & Mfr. 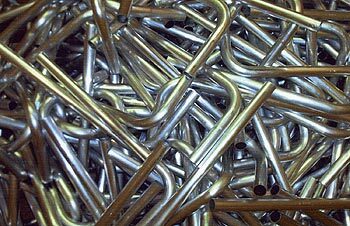 Tubular Parts & Assemblies. Specialties Include, Bending, Beading, Flaring, Flanging, Swaging, Welding & Mandrel Bending. IB & M Tubular Products has been fabricating tubes since 1923. Over those years we have acquired the experience and capability to design and manufacture some of the most complicated and precision bent tubes ever produced. Our standard bend tolerance on bend angles is plus or minus 1 degree with less than 10% flatness of the O.D. in bend area. We also do compression bending. Large inventory of bend tooling. .0625" O.D. to 3" O.D. Thin wall tubing with precision bend angles. Any number of RADII bends on the same tube. For those larger radius bends and arcs. We work with a variety of materials and we are accustomed to working on difficult projects. Let our professional staff help you in the design and planning of your project.